The landing site near Beaumont Hospital was used 20 times by Coast Guard crews last year. THE COAST GUARD’S helicopter service has suspended the use of the designated landing site for Beaumont Hospital after complaints from local residents. 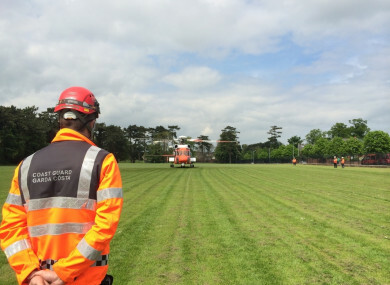 For the last number of years, a football pitch close to the hospital has been used as a landing site by both the Coast Guard helicopter service and the Air Corps to deliver patients to Beaumont, which is the country’s national centre for neurosurgery. The Coast Guard was involved in 20 incidents which involved a drop-off at the site in Beaumont in 2017. However TheJournal.ie has learned that following complaints from local residents, Coast Guard helicopter crews are now being diverted to Dublin Airport instead. In a post on its Facebook page back in November, the Beaumont Woods Residents Association, which represents people living in the Beaumont Woods estate beside the site, said it had made complaints about the helicopters landing “in such close proximity to our homes and our children”. The association said the proximity of the helicopters “raises serious safety concerns”. The complaints also referenced “the frequency of the helicopters and how traffic comes to a standstill as passersby stop to check this out”. The association said it was “only a matter of time before someone gets knocked down, running across the road to see the action”. One member of the association told TheJournal.ie that they had been given the impression the use of the football pitch would only be temporary, after the on-site heli-pad at the hospital was replaced with a staff car park. However, it has been years now and the hospital has not replaced the landing site on its grounds. Addressing residents on the Facebook page in a comment in November, Disabilities Minister Finian McGrath said he had made representations to Health Minister Simon Harris and had “highlighted the serious safety concerns”. “I am waiting for a response and you have my support,” he told them. Labour TD Brendan Ryan and Sinn Féin TD Denise Mitchell have also recently questioned the minister about the issue. The association later received a letter from Coast Guard operations manager Gerard O’Flynn to confirm that helicopter landings beside the housing estate had been suspended, pending the completion of a suitability survey. A spokesperson for the Coast Guard confirmed to TheJournal.ie that its helicopter service had suspended use of the football pitch at Mercy College, Beaumont, as a designated landing site on 25 November 2017. They said the Coast Guard has been in correspondence with the local residents association on the matter. The Coast Guard continues to use other landing sites in the Dublin area including Phoenix Park and Kilmainham Hospital as well as Dublin Airport for patient transfers to Dublin based hospitals. Air Corps crews have not been directed to stop using the site, despite the complaints. One emergency services source told TheJournal.ie that the use of Dublin Airport instead of the football pitch beside the hospital could negatively impact on the level of care the patient receives. “Suppose you have a serious head injury and now you have to go the airport, that’s adding on at least 15 or 20 minutes getting someone from there. It can be tricky trying to get the ambulance in and out of security and then there’s traffic in Dublin. If it’s a critical case you’re adding on time. If the patient is to have a good chance of survival, you need to get them in as soon as possible, those 20 minutes do make a difference. Although residents of the Beaumont Woods estate are opposed to the use of the site by helicopter crews transporting patients to the hospital, residents in other areas around the football pitch have expressed concern that the Coast Guard has decided to stop using it. Des Maguire, chairperson of the Beaumont Residents Association, which covers the whole Beaumont area, told TheJournal.ie that his association had not made any complaints like those made by the other residents association. “Ours is by far a bigger and more representative association, it’s been around for 21 years and we do discuss these things at our AGMs. While there are certain concerns say about the safety, nobody wants the thing stopped,” he said. “The hospital is very much part of who we are here and it’s an integral part of the community. We are very much aware that every time the helicopter comes here it’s landing in here for a very particular reason – mostly for head injuries where every minute counts. Nobody in our association wants to stop that or to take away any chance a patient has of living. I have one member, an elderly lady 99 years of age. She lives the closest to where it lands, the site is at the end of her garden and she has said to me on more than one occasion that every time it lands she says a decade of the rosary and that she’d never object to it landing there. Beaumont Hospital declined to comment on the decision to suspend use of the nearby site or the impact this is having on patient care. Email “Coast Guard suspends use of Beaumont Hospital landing site after resident complaints ”. Feedback on “Coast Guard suspends use of Beaumont Hospital landing site after resident complaints ”.